Sigh. I still say this doesn’t prove anything. Except maybe the quality of the people who use the internet. 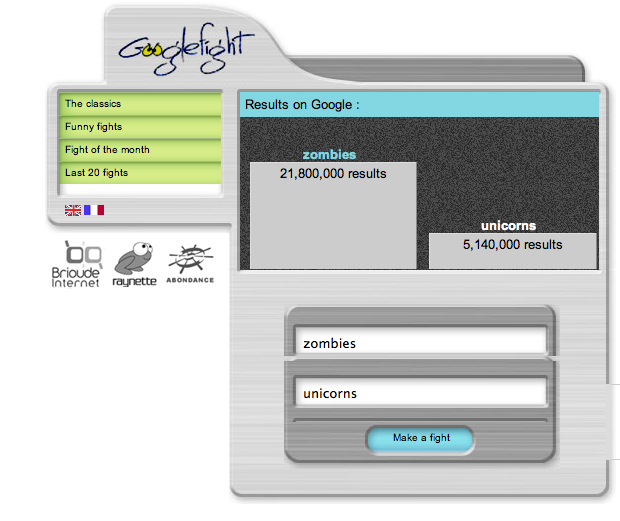 Categories: Uncategorized | Tags: Googlefight, Unicorns, Zombies | Permalink. Justine Larbalestier, who seems like a lovely person, who writes delightful novels about magic, and who no doubt sparkles with fairy dust even under harsh fluorescent lighting, has a sad, sad, handicap: a predilection for useless zombies. Yet, as all right thinking people know…Unicorns Are Tops! I mean, let’s think about this rationally. What, after all, can you do with a zombie? The best even Simon Pegg, zombie-supporter eloquenaire, could come up with, if I remember the end of Shaun of the Dead correctly, is to sit in a garden shed in his backyard with his pet zombie/best friend on a leash and play video games with him. Well…knock me over with a fun stick. Now, unicorns on the other hand…Unicorns are magic! If you’re very very nice to them and not at all condescending, you might get to go for a ride…and even on a real horse that’s pretty awesome – but this is a horse that is faster and stronger than any animal alive – faster even than Edward Cullen. You can also talk to your unicorn (zombie = poor conversationalist) and he will be very smart. Depending on who’s mythology you’re stumbling around in, you might get to fly. Unicorns purify poison water, make liars tell the truth, and bring you back from the dead. Also they are warm and quite good for snuggling up with in the cold forest. Unicorns = swift, airborne, uncatchable. / Zombies = slow, disjointed shamble. 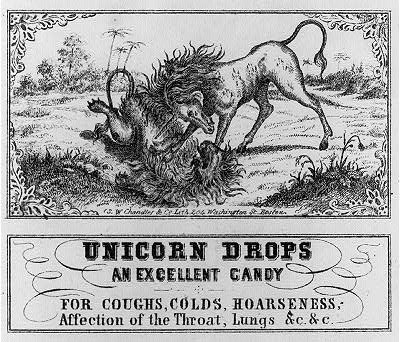 Unicorns = poison-free eternal life. / Zombies = guts eating, eternal un-life. Unicorns = better than an electric blanket. / Zombies = cold as the grave, and smelly. Categories: Uncategorized | Tags: Justine Larbalestier, Unicorns, Zombies | Permalink.